Overt symptoms of many diseases often do not manifest until days after a person’s initial exposure to the causative pathogen, typically a virus or bacteria. By then, the disease may have progressed to a level at which the benefits of patient treatment are diminished and the likelihood of pathogen exposure among a wider population is high. Doctors and public health officials would welcome warnings that enable them to begin early mitigation and containment of disease outbreaks. Researchers at MIT Lincoln Laboratory, the National Institutes of Health Integrated Research Facility (NIH-IRF), and the U.S. Army Medical Research Institute of Infectious Diseases (USAMRIID) are developing a technology that may provide those early warnings. The PRE-Symptomatic AGent Exposure Detection (PRESAGED) algorithm uses real-time physiological data, such as heart electrical activity (electrocardiography, ECG), breathing rate, and temperature, to calculate the probability that a person has been exposed to a virus or bacteria. PRESAGED is designed to run on data collected from noninvasive medical sensors—for example, wearable electrocardiographs (also known as Holter monitors). Sponsored by the Defense Threat Reduction Agency, the research aims to provide both effective individual patient care resulting from early treatment and faster, more confident implementation of public health measures, such as isolation, to improve overall population health by blunting epidemics. Using data acquired from non-human primates at USAMRIID and NIH-IRF, the researchers developed and tested PRESAGED for several exposure methods (intramuscular, aerosol, or intratracheal routes) to one of several viral hemorrhagic fevers, including Ebola virus, or the bacterial pathogen, Y. pestis. Because PRESAGED detects a subject’s physical response to the pathogen and does not recognize biomarkers for the pathogen itself, PRESAGED currently does not differentiate or identify the viruses or bacteria. The subjects’ physiological data were standardized to remove the effects of daily rhythms, aggregated to reduce short-term fluctuations in data, and then provided to a supervised binary classification machine learning algorithm. The machine learning technique used can learn subtle physiological changes over time and apply them to the data analysis, thus enabling an ongoing check for signs of pathogen exposure rather than relying on a one-time “snapshot” of physiological data, such as a single blood sample analysis. “The message that ‘earlier is better’ is found throughout medicine, and only recently have small, wearable medical devices enabled the persistent surveillance needed for detecting pathogen exposure. The earlier you know you’ll be sick, the faster you can begin to respond, and perhaps avoid the worst of the illness completely,” said Albert Swiston, a principal researcher on the PRESAGED project. “Earlier detection of epidemics on the per-person scale also offers an entirely new method for public health surveillance and countermeasures,” he added. During PRESAGED’s development, all of the test subjects did eventually display overt symptoms of disease, primarily fever. PRESAGED was able to consistently warn of possible viral or bacterial exposure more than two days before fever developed in almost all animals. Currently, the best-possible tests to indicate pathogen exposure are invasive, labor-intensive, serially-sampled blood-based assays, which may give only 6 to 12 hours of warning. The physiological biosignal features provided to PRESAGED during the primate testing were collected by implanted monitoring devices. To evaluate PRESAGED’s performance with data from noninvasive devices, which would be practical for clinicians and public health workers to use, the researchers conducted a computer simulation using a dataset that included only ECG-derived features, such as the time intervals between certain peaks of the ECG waveform. 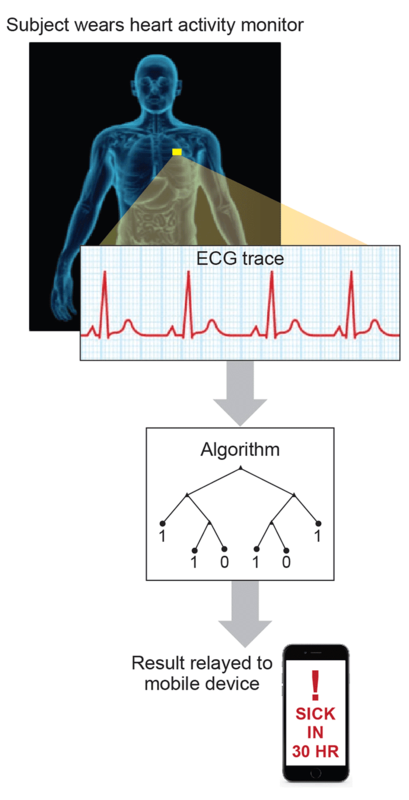 The PRESAGED team compared the performance of the PRESAGED algorithm when all available physiological features were analyzed against the algorithm’s performance when features derived only from the ECG waveform were considered. Only modest performance decreases in early-warning time and probability of detection were seen. These results suggest the implementation of this algorithm with ECG-based devices, such as wearable heart-rate monitors. PRESAGED is the first system capable of giving early warning of incipient disease symptoms (e.g., fever). The algorithm robustly predicts the probability of pathogen exposure, without regard to the particular pathogen, the exposure route, or pathogen dose. PRESAGED has also been shown to provide early warning on exposure to entirely novel pathogens (i.e., pathogens unavailable for algorithm training), suggesting that this approach will be robust in detecting emergent diseases, such as SARS/MERS or novel flu strains, well before new training data are available. The research team is working toward future iterations of PRESAGED that will include using the algorithm to identify specific pathogens, moving the implementation entirely to wearable devices, and making alerts to users over their phones or the cloud. Source: Adapted from original by Dorothy Ryan, MIT Lincoln Laboratory, edited for context and format by Global Biodefense.